Director and founder of Alpine Ascents International, Todd has achieved unparalleled success in the mountain guiding industry and is one of the world’s leading mountaineers. Todd spent most of his childhood in Alaska where his prowess and love for mountaineering were developed. In his eighteen years of guiding, he has led 8 expeditions to Mt. Everest, and has guided successful expeditions on every continent including all of the Seven Summits. In addition to instructing mountaineering courses, Todd has recently led successful expeditions to Mongolia, Rainier, Elbrus, Kilimanjaro, Vinson, Everest and a number of first ascents in the arctic region of Greenland. Recently, Todd led our trip to Cho-Oyu and runs our school and Denali programs in Alaska. Todd joins many of our expeditions in a support role, overseeing logistics, climber development and ensuring a good time is had by all. He currently lives in Alaska where he is raising yaks, fishing and flying. Forever climbing great peaks around the world, Todd just climbed Aconcagua again as well as Australia’s Kosciusko, completing his Seven Summits for the second time. In 1998 Todd was awarded the American Alpine Club’s prestigious David J. Sowles award for his rescue efforts on Mt. Everest in 1996. Gordon is a founding member of Alpine Ascents International and is responsible for overseeing daily operations and expeditions. He has a keen interest in business ethics, operational systems, marketing, maintaining the integrity of travel in local countries . A long term fixture in the adventure travel industry, he is on the Education Staff of the Adventure Tourist Travel Association where he leads travel development and marketing seminars in developing markets, and is a founder and board member of the Alpine Ascents Foundation. A long time independent traveler, Gordon scouts new travel and climbing destinations around the globe. He has a particular love of the Western Asia, from Peshawar to Bangladesh, Ladakh to Sri Lanka, this region of the world has always captured his heart and mind. He has also served as an Indian subcontinent expert for numerous media sources such the New York Times, BBC and Outside Magazine and has appeared on CNN, MSNBC and the NBC Nightly News. Please feel free to contact Gordon should you be interested in private tours, India trips or any of Alpine Ascents programs. Chris is a critical point of contact for our climbers. He manages international program registrations, coordinates international trip travel logistics, and keeps clients on track with their climb preparations. Chris recently arrived in Seattle, having grown up in Wisconsin and lived in Los Angeles for a dozen years. His interests include music, movies, and books. Tara is usually the first voice our climbers hear when calling the office, where she handles domestic program registration and communication, along with other data and design projects. With a background in botany and conservation work, she loves alpine and desert systems alike, and serves as our in-house plant-whisperer. An avid ultra runner, Tara is happiest when logging miles on the trails, and can also be found skiing, mountain biking, or diving down science podcast wormholes. Jonathon grew up hiking, climbing, and skiing in the Pacific Northwest. Early on he made outdoor pursuits his profession, and graduated from Western State University with a Bachelor’s degree in Outdoor Recreation and Business. Jonathon obtained his AMGA/IFMGA certification in 2007, and at the time was one of the youngest Americans to become an IFMGA-licensed mountain guide. Jonathon’s passion for the mountains and guiding has only grown over the years. He has climbed and guided throughout the Cascades, the Alaska Range, the Himalaya, European Alps, much of the western US, and many locations in South America. Jonathon has also spent the last decade working as a heli-ski guide in the winter, and doing research in avalanche mitigation and risk management. In 2016, Jonathon was a keynote speaker at the ISSW (International Snow Science Workshop), where he educated avalanche industry professionals about operational risk management. Jonathon’s well-rounded experience has also led to years working on gear development teams for companies like Black Diamond Equipment and Outdoor Research. Jonathon is a part of the AMGA national instructor team where he specializes in guide education. In the office, Jonathon manages Alpine Ascents’ world-class guide staff and programs, including the Alps Program he developed in 2013. He leverages his technical skills and guiding experience to ensure our trips are staffed and programmed to the highest level. When not working, Jonathon enjoys teaching his son to ski, climbing with his wife, and traveling the globe on family adventures. Alaskan transplant and resident cookie monster, Mary plays a leading role in guide scheduling and administration, logistics, and a multitude of other tasks to ensure the guide department is running like a well-oiled mountain machine. Mary is a longtime volunteer with the American Alpine Club, enjoys wielding an axe and building trails with the Washington Trails Association, and races for Spokeswomen Racing. In her somewhat limited free time, she can be found cyclocross racing, climbing (preferably in Indian Creek), and backpacking with Momo (her golden retriever). Matt works to ensure that our trips – near and far – are running smoothly on all levels. Having climbed, skied, and paddled whitewater both nationally and internationally, Matt is also our “Resident Gear Junkie”, with a thorough and versatile knowledge of all-things gear. He always enjoys geeking out about high-altitude boots, glove systems, or new fabric technology. Out of the office, Matt balances graduate courses in theology & business with training hard for whatever adventure might arise. He recently rock climbed a vertical mile in 24 hours, and guided a raft through the Grand Canyon. Brendan handles many of the day-to-day tasks that help keep our Seattle headquarters running like a well-oiled machine, and can often be heard on the phone with climbers talking through the gear required for an expedition. When he’s not tackling myriad projects around the office, he can usually be found exploring hard to reach corners of Washington’s mountains by foot or ski. He’s always happy to talk about obscure climbing and skiing objectives, or his extensive catalog of the best taco trucks en route to the mountains around Seattle. Whether answering gear questions for our Rainier climbs or carefully packing the supplies needed for three-month Everest expeditions, Mike is a valuable and friendly asset for guides and climbers. When asked, he will tell you that his favorite outdoor activities are climbing, skiing, and being on the water. Mike’s ability to eat any food in any quantity at any altitude constantly inspires us to eat our way to the top of any peak. Marc works to make sure that each trip and every client is ready when the day comes with the right gear, good food, and smooth transportation to and from the mountains. He has a penchant for perfectly organized gear and perfectly smooth logistics, so there’s always something to be excited about around the Gear Department! Though he hails from the Midwest, Marc quickly settled into life in Washington a few years ago. In his off-time, Marc enjoys pursuing climbing and skiing objectives in the Cascades, and is always a little too eager for long days and nights of Type 2 fun out in the mountains. Disco lover and backcountry baker, Maddie helps climbers get outfitted for their next expedition. She can be counted on for details of the latest audiobook and podcast release while caring for Alpine’s gear fleet. Enjoying all that Washington’s wilderness areas have to offer, Maddie skis, paddles, and climbs with Outdoors for All throughout the year. Gary directs the day-to-day financial operations of Alpine Ascents. He’s recently arrived in Seattle after living overseas for a number of years whilst working for various not for profits. Gary’s interests include soccer, cricket and a growing understanding of baseball. A life-long outdoor enthusiast, Matt has over 2 decades of outdoor industry experience and a penchant for media and information design which has garnered multiple awards. As Director of Information Technology, Matt manages and refines our network, media, and business systems, develops and designs our marketing, advertising, and promotional materials, and is in charge of all facets of our expedition cybercasts. He is also responsible for creating and maintaining our award-winning web site and keeping us sane when said technology become all together too much. Joe grew up in Talkeetna, Alaska and often leads our Yak treks in the beautiful mountains around his hometown. He is an avid traditional climber having spent numerous seasons enjoying long multi-pitch routes in Yosemite Valley, Tuolumne Meadows and Red Rocks, as well as satisfying his fingertips with technical rock climbing in Smith Rock, City of Rocks, Cochise Stronghold, and Joshua Tree to name a few. Joe has also climbed internationally in Argentina, Chile, Peru, New Zealand, Australia, Thailand and Nepal. Joe has a thirst for adventure; from ocean crossings in the South Pacific to 100 mile treks through the Himalayas. Having traveled in over 30 countries, he embraces the opportunity to experience new cultures and meet new people from around the world. Joe managed Everest Base Camp for five years and will now be transitioning into our Denali Expeditions and Courses as our Alaska Operations Manager. He also holds a Master’s Degree in Resource Economics and is focused on maximizing his utility through the enjoyment of the Earth’s natural beauty. Hailing from Duluth, MN, Dani transferred to our Alaska Operations, after managing operations in Seattle for 3 years. She is an encyclopedia of gear knowledge, extremely organized and pays close attention to every detail to ensure our Alaska programs are running smoothly on all levels. While her home crag of Palisade Head sits on the shoes of Lake Superior, she currently resides in Alaska during the summers where she can be found trail running, reading and training for future climbing trips. Willi has been climbing, guiding and teaching for the past quarter century. Willi is considered one of the premier instructors in America and his students have had outstanding success in reaching personal goals. He has amassed hundreds of ascents (many while guiding) in Washington, Canada and Alaska. Willi is an AMGA Certified Alpine Guide and in the past was responsible for training and certifying new guides, and accrediting guide services. Fluent in Spanish and well versed in South American culture he has an outstanding reputation for leading safe and successful trips. Needless to say, Willi has developed quite a following and has led climbs to Mt. Sajama, Cho-Oyu, Pumori, Island & Mera Peak and multiple guided ascents of Denali and in Mexico, Ecuador, Peru and Bolivia. Willi has led over thirty climbs to the summit of Aconcagua and is considered one of the world’s leading climbing and logistical experts in the region. Willi also bears the responsibility of training new guides on climbs around the world. Willi led our 2000 Everest, Vinson, Aconcagua, Denali and Kilimanjaro expeditions. Willi is the consummate mountain guide and one of the most respected mountaineers in America. Most recently Willi led our 2002 & 2003 Mt. Everest expeditions that put 31 climbers on the summit! Most recently, Willi competed on the National Geographic Channel’s “Ultimate Survival Alaska”. 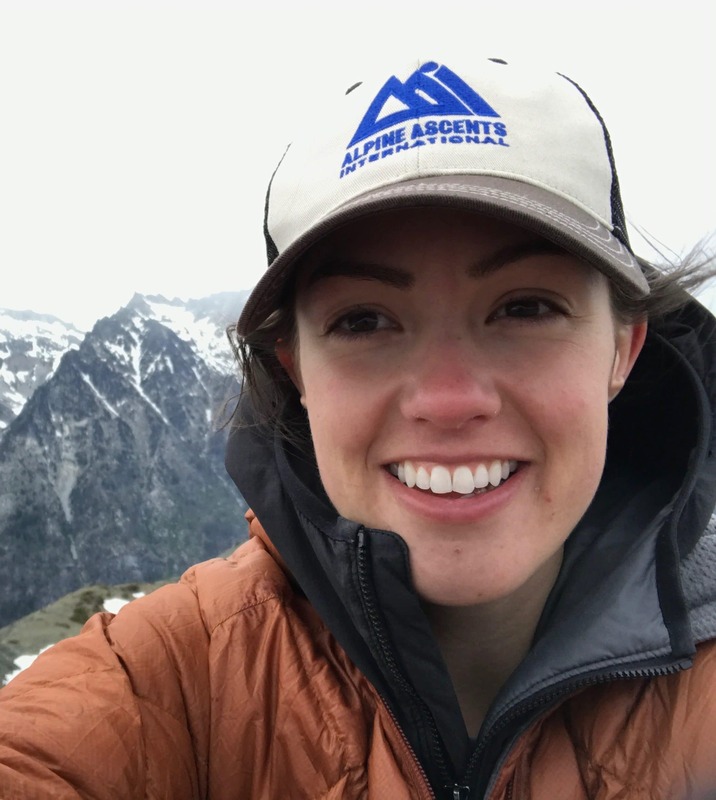 Hailing from the golden hills of La Grande, OR, Momo followed her family’s footsteps into the world of mountain guiding. Whether stealing Alpine Ascents hats from the heads of co-workers or checking mountaineering snack quality, she is always working with a wag and a smile. Momo is also responsible for keeping the collective blood pressure low, and thoroughly nap-testing all office furniture. I did very much so enjoy the course. I thought the material was taught at a good pace, with adequate amount of practice of the skills prior to the two ascents. The guides passed on their knowledge and experience by first talking, then demonstrating.